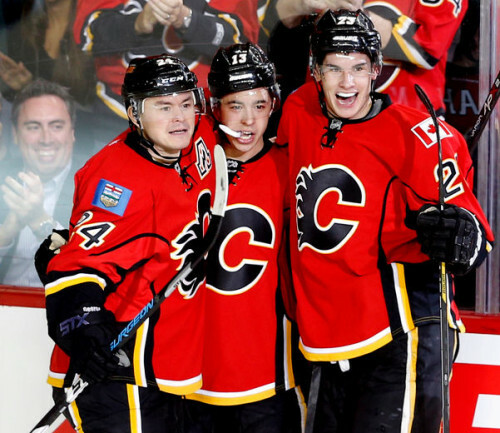 The legend of Johnny Gaudreau has obviously been well-documented throughout the season – with good reason – but there were two other rookies who also stepped up: Josh Jooris and Markus Granlund. Jooris, who impressed team brass in the pre-season, was called up early in the season and didn’t disappoint as he put up 24 points in 59 games. Granlund, meanwhile, appeared in only 47 games, but still registered 18 points in that time. But, of course, it’s impossible to discuss Calgary’s rookies without mentioning the kid they call Johnny Hockey – who stole the show not just on the team, but around the league. Gaudreau, even by his own admission, had an unexpectedly good season, in which he put up 64 points in 80 games. His success no doubt has a lot to do with the fact he was on a line with Jiri Hudler (who sits one spot above him in the team’s scoring lead) and Sean Monahan (who sits one spot below). Speaking of team scoring, the Flames scored 236 goals, which put them fifth in the league. That had a lot to with the balanced attack Calgary threw at the opposition every night, from the forwards right down to the defenceman. As mentioned, the Hudler-Monahan-Gaudreau line was by far the leader among forwards, but Lance Bouma, David Jones, Joe Colborne and Mikael Backlund each provided good secondary scoring. Overall, the Flames had nine players with at least 30 points. That number was helped by the production from the league’s top scoring group of blueliners. Only the Nashville Predators came close to the 195 points registered by Flames defencemen, falling short by just three points. What’s more: Dennis Wideman, Mark Giordano, TJ Brodie and Kris Russell finished 4th to 7th respectively in team scoring. If Giordano hadn’t been injured, he could have been a legitimate contender for the league lead in points by a defenceman. His success has already been indirectly referenced above, but there’s something to be said of Sean Monahan’s second season in Calgary. After a decent rookie season – one in which a 19-year-old Monahan, who unexpectedly made the team out of training camp, put up 34 points in 72 games – the question was whether or not he would be affected by a rookie hangover. Monahan answered in 2014-15 with an emphatic no. He nearly doubled his production from last season, recording 62 points, and his 31 goals were tied with Hudler for tops on the team. That he was held scoreless only three times following Giordano’s injury only magnified his already significant contributions to the team. He was by no means the only reason for the team’s success, but his efforts definitely went a long way in getting the team to the playoffs. “It’s not how you start, but how you finish” so the saying goes. Well, apparently the Flames enjoyed finishing their games by sending their fans into cardiac arrest. Comebacks were something of a regular occurrence for the Flames, who had four third-period comeback victories – 10 if you include games they tied in the third and won in overtime or shootout. In all, the Flames had 13 (!) wins that came in overtime or the shootout, of the 20 games they played that went past regulation (not all of them come-from-behind, but very impressive nonetheless). Since mid-February, though, the Flames have found themselves employing a different strategy: winning games after surrendering leads as opposed to clawing their way back late.